The Church of Christ in Zion, Illinois (Lake County) is made up of people who simply Christians, without being members of any denomination—and you can be too! Our goal is to present the stories of the Bible in their proper historical and cultural context. The Bible class curriculum for our children and the Bible study guides for adults are prepared by members of this congregation and are well adapted to the needs of the students. The printing and production of these handouts and teaching aids are both expensive and time-consuming, but the brethren here believe such efforts are well worth the effort—the souls of our children and the future of this congregation depend upon a well-balanced teaching program. Printed sermon outlines are prepared for every lesson so those in the audience can easily follow along. When members of this congregation are absent on the Lord's Day, copies of these outlines are mailed to them along with a note to let them know they were missed. Our meetinghouse is located at 2340 Lewis Avenue in Zion, Illinois, just a mile from the Cancer Treatment Centers of America at Midwestern Regional Medical Center. Our membership includes Christians from the local area, as well as those who travel from places in Illinois like Gurnee, Round Lake, Antioch, Waukegan, Lake Villa, Grayslake, the Great Lakes Naval Base, and Chicago, as well as from cities in Wisconsin, such as Pleasant Prairie, Kenosha, Racine, and Milwaukee. Sunday Bible Class ... 9:45 a.m.
Sunday Preaching ... 10:45 a.m.
Wednesday Bible Class ... 7:15 p.m.
Jeff Asher has written a marvelous series of articles on How To Teach Biblical Values To Our Children. Biblical values such as contentment, courage, forgiveness, morality, and self-control, are no longer taught in most public schools. God intended for these virtues to be taught and learned in the home. Unfortunately, many people feel unequipped to teach these fundamental values. 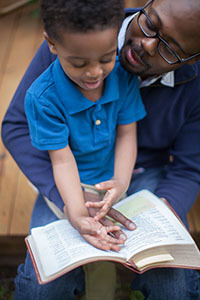 These articles will help parents teach Biblical ethics to their children—and the parents might learn a few things along the way! If you would like to know when we add new Bible class books, study guides, sermon outline books, or Bible land photographs to this website, then just like us on Facebook, or connect with David Padfield on LinkedIn.